The EnvisonTEC 3D-Bioplotter can 3D print a great variety of biomaterials. Precisely print bio and other materials with this amazing 3D printer! 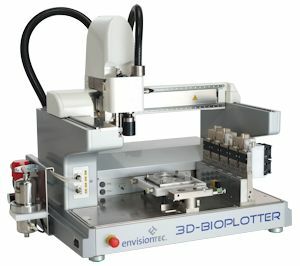 The Bioplotter is the ideal tool for production parts or to mimic biological systems for research, testing and diagnosis. Utilize a wide range of materials… from soft hydrogels over polymer melts up to hard ceramics and metals. The Bioplotter is not locked to proprietary materials: choose your own vendors and customize materials as needed for ideal medical grades, mixture compositions and concentrations, additives, etc. 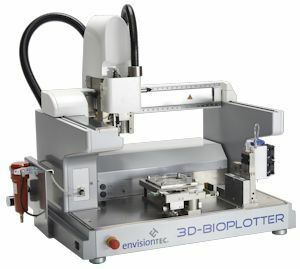 The 3D-Bioplotter is specifically designed for work in sterile environments. Medical-grade materials can be used. Uses raw materials (powder, pellets, etc.) without requiring a preprocessed filament. Designed for use in a sterile biosafety cabinet with built-in sterile and particle filters for the input compressed air. Materials are kept in sterilizable cartridges, thus avoiding touching the machine: easier to clean and sterilize. Create your own processing parameters.